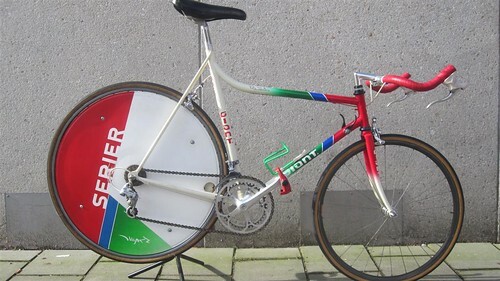 Peter Serier started as a frame builder in the 70’s at Presto, where he did his apprenticeship under the supervision of the legendary Jan Legrand. He also built frames for Peka in the early 80’s when he was still working at Presto. He went going on building frames under his own name (Serier). Serier, however, was more of a craftsman than a tradesman and his own brand never really made it. Serier used old fashioned steel lugs for his frames instead of the allready more common microfusion lugs (which are cast and have very tight tollerances improving ridgidety of the frames they are used in). Advantage of the old fashioned sheetsteel lugs is the adjustability of angles, something that can’t be done with the stiffer microfusion lugs. Serier’s frames are well known for their superiour finishing, something we are not surprised of hence Peters’backgraound in precission engineering. When South Korean manufacturer Giant came to Europe in the mid 80’s they employed Serier. His knowledge and craftmanship had an enormous influence on the devellopment of the Giant teambikes of the era. Until 2010 Peter had his own website (thankfully nothing really gets lost on the world wide web, see www.seriano.nl) He had a designstudio where he did not make any bikes. He did produce some furniture which looked to be inspired by bikes, like ‘De Stier’, which is dutch for ‘the Bull’.